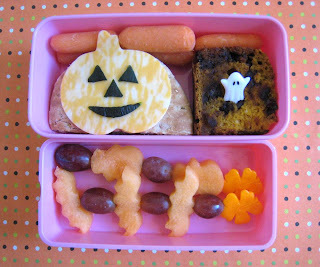 BentoLunch.net - What's for lunch at our house: Today's Pumpkin Bento, with Pumpkin Bread! Today's Pumpkin Bento, with Pumpkin Bread! It's pumpkin time! Rounding out my Halloween bonanza, we definitely needed some pumpkins again. This time, it's complete with pumpkin bread (to go with pumpkin cake & pumpkin cheesecake that we had earlier this month). And since pumpkin goes really well with chocolate, it's pumpkin chocolate chip bread! Miss Faith had a roast beef & cheddar sandwich with pesto cream cheese spread (basically homemade pesto mixed with cream cheese, very easy). It's topped with a marble cheddar jack-o-lantern with cucumber features. In the top tier, she also has carrot sticks and chocolate-chip pumpkin bread. Looks yummy, doesn't it? The bottom tier holds cantaloupe and grape kebabs--the cantaloupe is skulls or bats. I added extra grapes after taking the picture, but really wanted the shaped cantaloupe to show for it. Who wouldn't want to eat bats and skulls? I made pumcho too! Mine were muffins. YUM! Yumm, that bread looks so good! The marbled cheese gives the pumpkin great dimension. And of course, pumpkin bread makes everything better. Pumpkin anything, I think. I made pumpkin butter the other day and I can't stop eating it!